I have gone to two concerts recently and am looking forward to a third. In December I attended a concert in Melbourne, FL. I had told Ronnie in his chatroom in November that I was planning on attending this show with my daughter. He said to let them know we were there and we could go meet him after the show. We arrived early and watched everyone running around. I had brought something for the band and crew to munch on and the person I found to give it to was Ricky. I introduced myself and talked with Ricky throughout the night. He was very nice and pointed me in the right direction to make sure we were able to meet with Ronnie. I told him we were also planning on coming to the Sebring show in a couple months. He said to let him know when we got there. 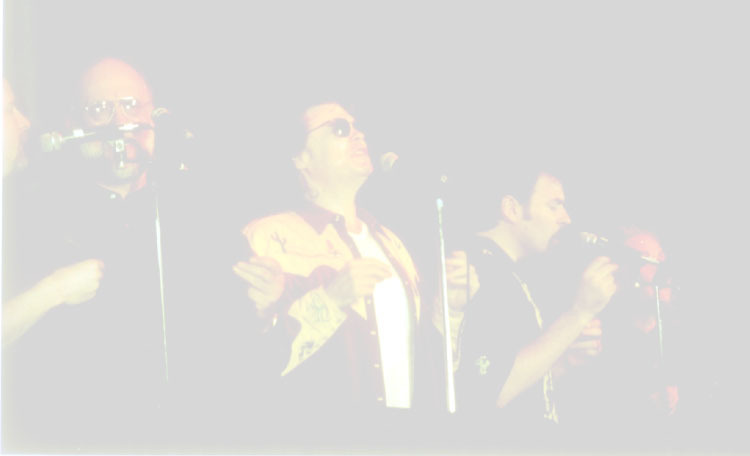 February rolled around and we drove down to Sebring to spend the day at the fair and see Ronnie's show. When we got there I went searching for Ricky. We found him pretty quickly. He seemed happy to see familiar faces and invited us back to watch the sound check and set up. We spent most of the day talking with him and watching all the activity. The show was awesome and we stayed for both performances. During his second show Ronnie gave us the highlight of our day. He was mentioning his website and the fan forum and told everyone they could go check it out and talk with "Jo and JBug." Wow! We were totally surprised and shocked. Probably could have knocked us over with a feather after that one. 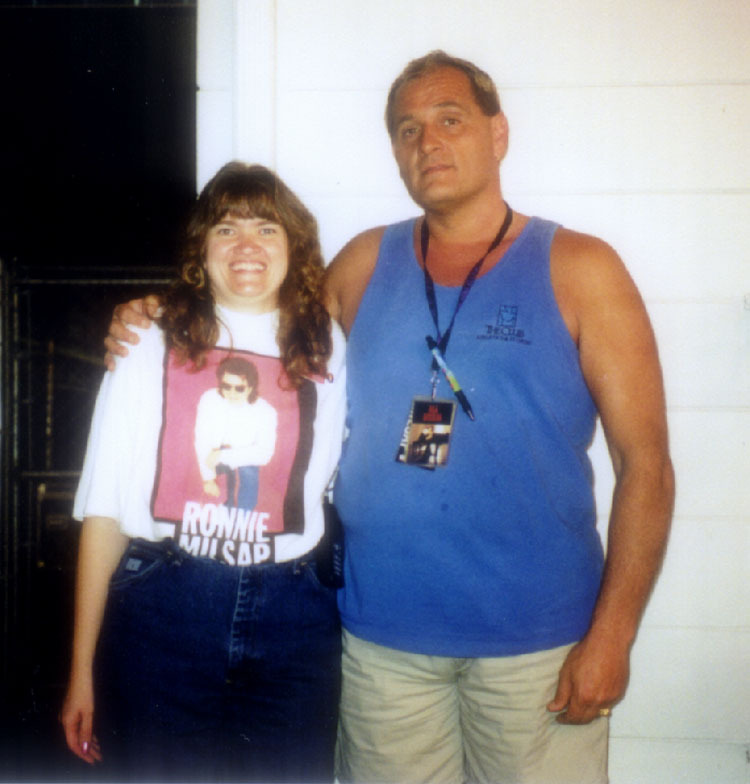 Sheila's memories of meeting Homer - When we came from the motel, we were told that Homer and some friends had come from NC to see Ronnie in concert. Walking to the door, Ronnie and Homer were at the bus and Ronnie introduced us. He was the sweetest and nicest man one would want to meet. I don't think Homer ever knew a stranger. He told us about when Ronnie was a kid, he used to take him for walks and about Ronnie "sitting under the porch beating pans and singing." Wondering if Ronnie was getting embarrassed, I looked at him only to see him smiling. Homer didn't mind having his picture taken either! Sheila's memories of traveling with the buses - I was going to a show in Michigan and wasn't that far from the destination when to my right I noticed the familiar bus. I stopped and asked what was going on. No surprised faces here. I was someone they knew! They just about had the bus fixed; the girls said that they were hungry, I looked at my watch knowing that we had plenty of time, so I asked them if they wanted to go and find a place to eat. I followed the bus to the place where the show would be and they stopped to check in. Someone came off the bus and over to the car, I rolled down the window and a pass was placed on the dash. We drove on in past a gate. Soon after, the girls and I went to find a place for them to eat. After the show, we were headed back to the interstate. Ronnie asked me "Sheila, are you going back to Kentucky with us?" I told him No, that I was on vacation, and that my Grandmother and I were staying all week. He said "Ok, then be careful." I said "Thanks Ronnie." I just got the idea of going to more shows and with them! Sheila's jogging fun - I'd heard about this show for months over the winter and couldn't wait to see spring. After the show, Ronnie and I discussed running again, and he said he would be ready in five minutes. When he came out, he asked "Are you ready Sheila?" "Yea, Ronnie lets go for it." He, Phil, and I ran down the road beside the motel. He said "Sheila, come over here. Here comes a car." I said "Huh?" I heard nothing and turned around to see nothing, then I saw lights. Man! Talk about the man's hearing! Dude gets some friendly harassment from bandleader Jamie (more memories from Sheila) - This was in 1992. Darrell, Steven(Dude), and I went to see Ronnie in Nashville, IN. Steven was about 8 at the time. This was the hottest summer reported. Jamie (band leader) had a broken arm. Not knowing him that well, I soon found out how much of a joker he really is. I asked "Jamie how did you break your arm?" Steven was standing beside me and Jamie said "He did it!" and pointed to Steven. He teased Steven and was telling people that this kid had broken his arm. Steven felt comfortable after that. And I knew that Jamie would fit right in! Steven and I were discussing the lyrics to one of the songs on BACK TO THE GRINDSTONE. I asked Billy Coren who was correct because the winner would get an ice cream. He didn't say anything. He just pulled Steven in the door and bought him an ice cream. A friend for life!